It started with Silent Sunday. Mama and More posted a rather intriguing picture of herself that left us all guessing. 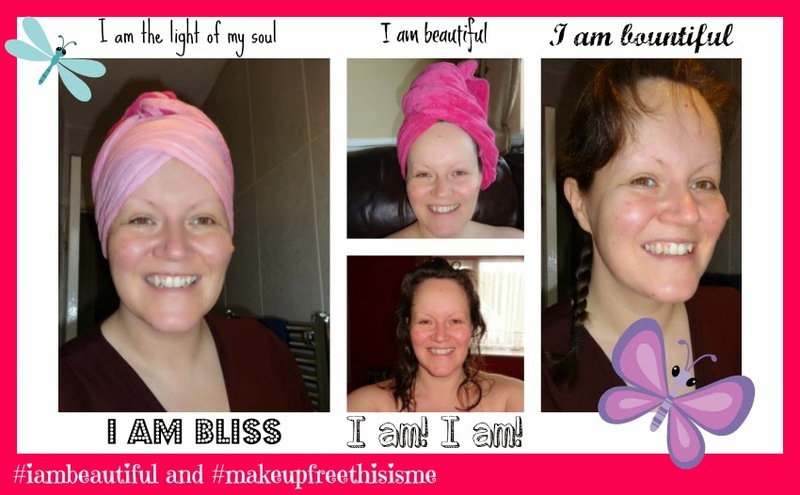 Thankfully she followed it up with this post: I am Beautiful, Make-up free this is me! It was a rather timely post for me to read, to say the least. The husband filmed me on Wednesday for a project a group of bloggers are participating in, and when I viewed it back, I felt as if I was looking at someone 10 years older than myself. I didn't recognise me! It was like the woman in her prime had become a crone. Fast forward to Thursday, and my best-friend who is much younger than me, was discussing how she has lost her looks, her beauty, how life has aged her. I didn't let her know the synchronicity of her thoughts, as I wanted to let her have her moment. Sometimes when we have an outpouring, it isn't helpful when the other person butts in to say "I feel like that too". I did tell her on Friday though. It led to a VERY interesting conversation where I explained that back when I was teaching Kundalini Yoga I had an inner light that radiated out that made me look radiant and youthful. I explained that the lack of yoga since 2010 means I have lost my inner light. My yoga is based on Sikhism, yet my friend is Muslim, and her beliefs mirror mine. She went on to explain that she believes that if she does all of her prayers every day it will bring "light" into her, and she loses "light" if she does not do them. We both really believe this. It's made me want to fully get back on my spiritual path, and as is always the case when I feel like this, someone up there gives me a nudge, and in this case it was my reading of Mama and More's blog. So, it made me want to link up with the I Am Beautiful Link Up. Top middle is fresh out of the shower with a towel on my head. Below it, towel off, hair au-naturel (I don't have any colouring whatsoever). Far right is the plait that I do, before I put on a head covering, which I do now everyday. Far left, head covering (scarf) on ready to face the world. Only addition, moisturiser. So this is me. The words you see, all over my collage....?!?!? They are from a mantra that we sing in Kundalini Yoga. I used to go to the European Yoga festival every year (8 days in France) and it used to be a fabulous experience to sing it loud and proud with 1500 other people. It comes with celestial communication "movements" you can do with it. It becomes a deep transformative celestial communication meditation that makes you feel beautiful INSIDE and OUT!!! "Oscar Winner Lupita Nyong'o's Speech On Beauty That Left An Entire Audience Speechless"
Bye bye, from beautiful me to beautiful you. P.S. I am also aged Ssshhhhhh... 41!!! You look stunning. Thank you so much for linking up today. You are beautiful inside and out. You are beautiful but the camera has to like you too. I very rarely get a good photo even though I'm not complaining how I look in real life. Even professional photographers are surprised that they can't get a good photo of me. I wish i could go make up free. My scars and marks are too much, & I have to hide them. I would love to be like the ladies in the photoshop video, & reject the fake images, but i bet id love edited images more than real ones.